First stop was San Diego last weekend, to be more precise staying in Poway, where I was happy to attend my cousin’s wedding on Saturday evening. By about noon the next day, however, smoke was in the air, and the fires had begun. Very early on I sensed that the burn was closer to Poway than the original reports stated. As I drove up toward LA, I saw that the smoke seemed to be emanating from an area just south of Escondido. The weather was perfect to fan the flames; hot, dry and windy. Sunday evening, I drove back down to Poway, listening to the radio reports on the fires, the evacuation of Ramona, where my uncle lives, the school closings, etc. At the hotel things were smoky but it seemed safe to stay over. In the morning I called another cousin and found that they had evacuated their house the night before. I learned today that my uncle’s house burned to the ground. The only good news in compensation is that no one in the family was hurt. On Monday morning I flew to New York, where it was also unseasonably warm for late October, and stayed in a new condo in Brooklyn that my friends just moved into. It was a nice if too short stay. Then back to Europe, and to the south to spend the weekend in Zurich. Just a couple images from there to finish off. The first one caught my eye as a clever logo – it’s not an endorsement of smoking! 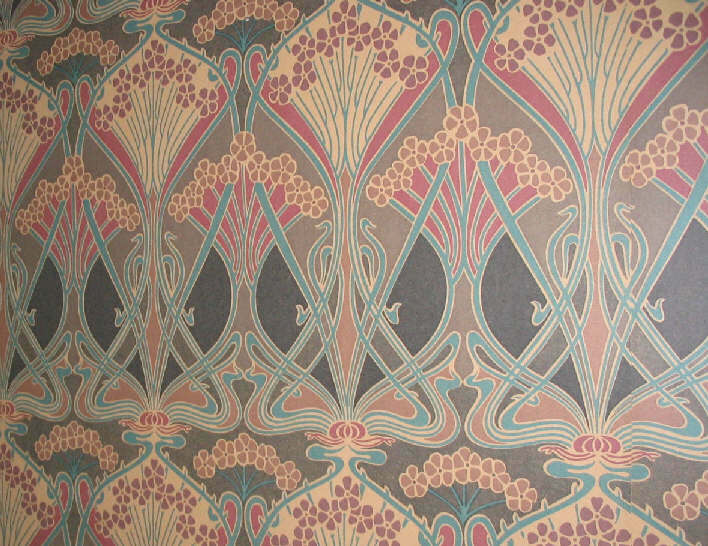 And the second is wallpaper from my friends’ apartment stairway. We are generating millions upon millions of low-skilled jobs in the service economy. We need to turn them into good jobs. It amazes me that no one can see this. Not in the US. Not anywhere else. The right says the market will fix it. The left wants to rebuild manufacturing. Can someplace, somewhere out there pay attention to this and organize the world’s first service economy summit devoted to turning service economy jobs into better paying, more fulfilling, longer-term, career-track creative jobs. It seems overly optimistic to think that it will be simple to make such a transition. I think that the U.S. was able to create a well-paid middle class in large part due to its position after WWII, when the rest of the developed world was at a disadvantage. Unions fought for higher wages, and industry could afford it because the U.S. dominated markets. But nowadays there’s a lot of competition. In general to be well-paid you need to provide lots of value in your work. Many service jobs are low-paid because almost anyone can perform the jobs. To make these jobs creative means that the standardization level needs to be decreased. On the one hand I do believe that most people can master some skill or service and become really great at it; but whether they can all find a way to market that skill effectively is another story. The Stedelijk Museum in Amsterdam has a new Warhol show up, and it’s quite different from any other I’ve seen. This one does not concentrate on the iconic screen prints of soup cans, Marilyns, etc. Instead it puts the focus on the film and multi-media work, and does it in a brilliant way. In one room they have the Screen Tests running – each wall is a screen, and each program is a set of ten tests (each is about 4 minutes, so about a 40 minute loop). At most you can see three of the walls at once, so you can glance across at three of them simultaneously. These were filmed at 24 fps but are shown at 16 fps, so every movement is just a little slow. There I saw Lou Reed, Susan Sontag, Harry Smith, and quite a few others. I like the way the images start to fade in, last awhile, and then the film ends and the images fades back out. Then in the main film room they had 19 films running simultaneously! It was a long room, so a film about every 20 feet or so along the wall, each with a nice explanatory panel and a timer that showed time elapsed, but then also films on hanging panels that made the image visible on both sides. Plenty of places to just sit and look, so in some places you could see five or more films at once. There is Henry Geldzahler sitting in the couch, becoming meeker and meeker under the camera’s strict gaze. There Julia Warhola (Andy’s mom) at the ironing table. Way on the back wall, the 8-hour Empire getting toward very late night. And there’s Maria Montez suggestively eating a banana. And so on. This setup probably would have seemed completely insane back in the sixties, but now in our media saturated times having five+ screens available at once seems about rights, especially for these Warhol films where often not very much is happening at any given moment. They are more like pictures that move slowly, and thus being able to see many of them at once is similar to being in a gallery with multiple paintings. I hope to go back to spend more time in the film room, just soaking up some of this stuff that has been remarkably hard to come across over the years. Another room of the show has individual TV screens set up to show the cable TV programs that Andy did in the 80s. I saw parts of a few of them; the highlight was an interview with John Waters and Divine from 1980. Here are a few of my shots from yesterday. Another gorgeous weekend here! I’m getting lucky again with the weather. As you can see from these shots, the old canal of Utrecht, Oudegracht, is a bit different from most of the city canals in the Netherlands, because there is a lower level which was originally build for warehouses and loading/unloading (quite practical in fact). Nowadays many of these spaces have been converted to restaurants. And last but not least a still life view from my window. For African pop fans, or those who want to find a starting point for learning about it, I’d recommend the new release of classic tracks by Congolese artist Tabu Ley Rochereau, The Voice of Lightness, put out by Sterns Music. The two CDs cover recordings from 1961 – 1977, and it’s good stuff; follow the link to get short tastes. Enjoy. I liked this short essay by Paul Graham, on ‘stuff’. He’s got a bunch more on his site, mostly on tech-y issues, but not all. If you want more help to get rid of stuff, I recommend this book: Clear Your Clutter with Feng Shui by Karen Kingston. It’s fairly light on the Feng Shui and heavy on practical suggestions. Here’s a map of the city from 1652 (in this version north is to the left). I’ve marked where I live with the downward pointing red arrow. Much of what’s shown in this map is still very recognizable, from the canals to the Dom (tower and church at the center) to many of the streets. Click on the map above to see a big version. Below is a current map – same area, just rotated about 90 degrees to put north at the top. In this map, my place is just about at the ‘h’ in ‘Utrecht’. Well, the movie with six Bobs did indeed get made, and it’s coming out shortly. “I’m Not There” directed by Todd Haynes (who’s been living in Portland recently); interesting story in the NYT Sunday Magazine by Robert Sullivan. I’m glad to see that weird movies still have a chance! 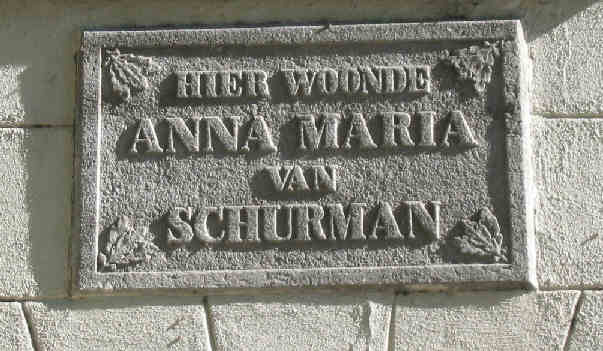 I of course wondered who this was, and found quite an interesting Wikipedia entry for her – she moved to Utrecht as a child in 1613 and became perhaps the most educated woman of the time. Her view of the nearby area probably was not so much different from the shot below (my building with the awning), though they didn’t have bicycles back then!